Retro Restuarant Burgers, "Sauces, shakes, & Fries"
PICKLE BURGERS…and MUCH MUCH MORE! "THE ONE OF A KIND COOKBOOK", for food that looks, smells, and tastes JUST LIKE THE RESTAURANT! BRAND NEW, 44 PAGES, SOFTCOVER BOOK, SOLAR-VISION PUBLISHING COPYRIGHT 2010! Quit wasting hundreds of dollars each year on the food you love, when you can create it right in your own kitchen! CHOCOLATE RESTAURANT MALT..........AND MUCH MUCH MORE! For the ULTIMATE BBQ SAUCE FAN, OUTDOORSMAN, FAMILY MAN, OR FOR SUMMER BIRTHDAY BASHES, CHURCH GATHERINGS, ETC! This book COVERS ALL YOUR grilling needs, AND THEN SOME!!! 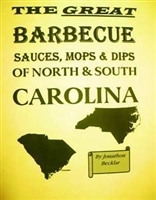 This book describes the regional diversities of the mops, dips, and sauces of North Carolina and South Carolina as well as what the difference is between a mop, dip, and sauce truly is!!! Don't leave home without it.... or forget to enter the kitchen WITH IT!!! JAPANESE BARBECUE SAUCE AND MARANADE...................and much much MORE! THE AMAZING BARBECUE SAUCE COOKBOOK By A.E. EDWARDS! THIS SUMMER IS GOING TO BE A SCHORCHER! YOU LOVE TO BARBECUE? THIS IS PERFECT FOR THE FAMILY THAT LOVES TO GRILL OUTSIDE, THAT OUTDOORSMAN THAT LIKES DRINKING AND GRILLING WITH HIS BUDDIES AFTER A HARD DAY'S WORK, OR FOR GET TOGETHERS FOR FRIENDS THIS SEASON. COUNTY FAIR BARBECUE SAUCE.........................AND MUCH MUCH MORE! THE NEW JERSEY ITALIAN DELI RESTAURANT COOKBOOK---RARE!!!! NEW YORK, CHICAGO & BEYOND PIZZA COOKBOOK "Sauces! Doughs! Flavored Crusts! Toppings & More! This cookbook is truly special and combines EVERYTHING you need to know for the ULTIMATE PIZZA LOVER! This 48 page cookbook is JAM PACKED with all the MOUTHWATERING pizza sauce variations you could ever WANT, as well as BUTTERY HOMEMADE pizza doughs, EVEN FLAVORED CRUSTS! DRIVE IN THEATRE PIZZA SAUCE................AND MUCH MUCH MORE! 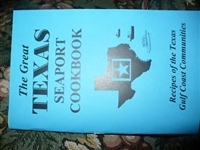 THE GREAT TEXAS SEAPORT COOKBOOK, "Recipes of the Texas Gulf Coast Communities"
Brand New,Softcover, Solar-Vision Publishing, Copyright 2010,40 Pages! Texas cooking is the heartland of America, it has the best of EVERYTHING! DAY STARTIN’ CORNBREAD PANCAKES............AND MUCH MUCH MORE! THE INDIAN RESTAURANT COOKBOOK by Naheed H, M. Rafai, Troy Edwards and Amber I. - 2009 softcover book, 44 pages! - The long awaited, and long requested Indian restaurant cookbook IS HERE!!!!!! And it's a good one! The authors have chosen thier favorite Indian restaurant specializing in the Gourmet dishes of India and have shown you how to make it ALL in this one book! NOT your average Indian cookbook, that's for sure!!! Very targeted, and very specific Just a highlight of the recipes include:Tandoori Chicken, Banno, Kebab Chicken, Tikka Palak, Chicken Curry, Indian Cheese Hors D'Oeuvre....AND MUCH MUCH MORE! THE MIDDLE EASTERN RESTAURANT COOKBOOK By Naheed H. & Amber I.
Solar-Vision Publishing/Brand New/Softcover/40 Pages/DOZENS OF RECIPES!!! Item Description: Solar-Vision's Latest Edition to add to your coookbook collection!! Author says, " I was pleasantly surprised that in the interim, she had already put together a dozen more recipes, and I took her out to lunch and dinner at this place many, many times during my stay – and we REALLY DID IT – in this book is how to make EVERY dish on the menu, it is the closest you can get to actually eating at the restaurant. Just a highlight of the recipes include potatoes "Harra, Pita bread crisps (chips),Special Middle Eastern rice, Lamb Rice Pilaf,(entree or side),Mjudra (Lentil Stew),Maklouta(Bean Stew,Falafel,Kafta,Zaatar, Cheese and Zaatar,Mediterranean Steak and Cheese Lamb Sausage (Makanek),Baked Eggplant,Maghmoor, Arabic Yellow Rice,Okra and Beef (an Egyptian favorite).........AND MUCH MUCH MORE!